“This evil thing you’ve conjured up is only in your mind,” says Claude Rains to his son in the 1941 classic The Wolf Man. This line is just one of the many hints the screenwriter put into the story that proves that this was the only Universal Monster movie that didn’t actually have a monster, but rather a man suffering some psychotic delusion induced by hysteria, depression, and superstition. This film is not about a monster at all, but about man’s dual nature of good and evil. The transformation into the wolf man is all in the main character’s head. We see him as he sees himself. Even from the encyclopedia definition of Lycanthropy in the beginning it says: “disease of the mind in which human beings imagine they are wolf men.” The Wolf Man is also the only Universal Movie Monster that actually feels any remorse for his actions, humanizing him further. Even in the sequels he’s looking for a way to end the curse. This is the case all the way through his most recent descendent TV’s “Teen Wolf”. He’s also one of the only monsters that doesn’t have a literary antecedent like The Phantom of the Opera, The Hunchback of Notre Dame, Dracula, or Frankenstein. Whether The Wolf Man is an allegory for our transformative nature or puberty or sexual awakening or the duality of man…it all adds up to affecting our sanity. The moon is an apt symbol as the moon itself transforms each month. There’s another line in the film that backs up this reading: “Most anything can happen to a man in his own mind.” Universal was on to this interpretation and ordered everything that might leave it ambiguous to be edited out. After all, they wanted a movie franchise…which is strange because people seem to forget that in The Wolf Man…he freakin’ dies in the end, but then suddenly there he is facing Frankenstein in his next movie and ultimately facing Abbot and Costello! The literary term I’d like to explore is MYTHOLOGY. In this case it’s a tale that’s culturally based that teaches about a cultural belief, the power of superstition to affect the human mind. The main character is already depressed about his brother’s death. 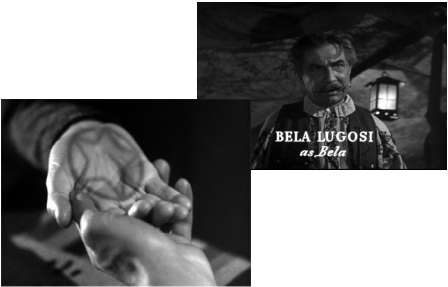 He causes the death of another man (Bela Lugosi playing a gypsy named Bela if you can imagine that), thus leading to a mental breakdown. Add to this all the wild tales about wolf men and werewolves and it all brings about the mental breakdown of the protagonist. What I love about this movie is that the screenwriter made the whole thing up. Okay, so he stole the silver killing them idea from Bram Stoker and vampires, but all the curse passing through a wolf bite (which I have never understood), the silver bullets, the transformation by the full moon, the seeing of the pentagram in the palm of the next person he will kill…okay so movies have let that one go, but it was here first! All this MYTHOLOGY was created by screenwriter Curt Siodmak, though Robert Louis Stevenson dealt with this duality of man in his novel Strange Case of Dr Jekyll and Mr Hyde. It’s also rooted deeply in the horrors of Emile Zola’s La Bête Humaine. For me, the most interesting part of this movie is how Lon Chaney, Jr. acts toward the female lead in the beginning of the film. I mean, my God…he’s peeping at her through a telescope, then he stalks her and she’s engaged to another guy! NOW THAT’S A WOLF MAN! Why do cultures make up these stories?